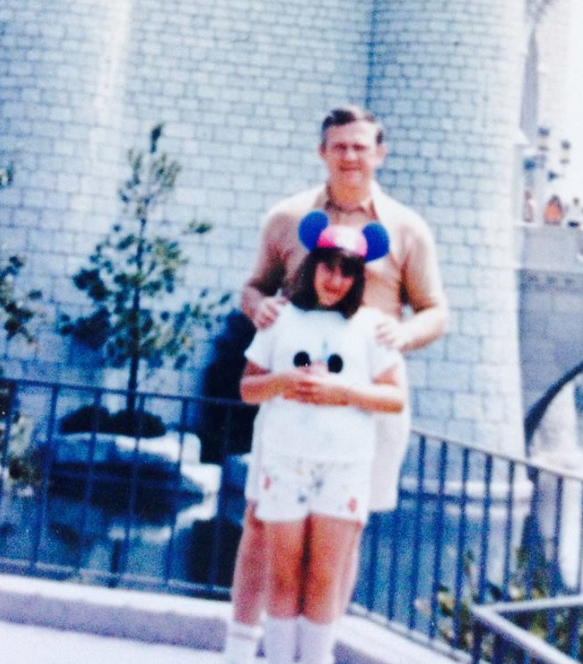 The author and her father in Disney World, 1974. I remember waking up in the middle of the night, excited yet sleepy. Our luggage was packed and loaded in the car from the night before. We bid adieu to our house in Westchester County for two weeks, and drove toward the city, heading to the George Washington Bridge. Route 80 would lead us south to Florida. Still dark, I marveled at the pre-dawn beauty and crisp feel of a summer night as it was about to become a new day. Streaks of orange and periwinkle blue slowly streaked across the sky. We had WNBC AM Radio on and I remember hearing, Maureen McGovern’s “The Morning After” (not the pill) playing over the small speakers in our Buick Century station wagon. There we were – my dad, my mom and me -finally riding down the NJ Turnpike in the “lonely cool before dawn”. Sometime after this song played, the DJ, inspired by the idea of ‘morning’, put on Diana Ross’ “Touch Me in the Morning”. The music continued on during that long drive down to Kissemee, with many stops along the way: Savannah GA, St. Augustine, Orlando to name a few. When we got down into the Carolinas, and the thrill of counting down the next Stuckey’s and miles until “South of the Border” became monotonous, the one song I remember the most was The Raspberries’ “Go All The Way”. It has always brought me back to that first trip down to Disney World. Even today, when I hear the song, I get that sweet, sickly feeling of being in a new, exciting place – away from the sameness of home – ready to see Mickey Mouse and go on plenty of E Ticket rides. We stayed in the Americana Hotel which had the first atrium styled hotel I’ve ever seen in my life. The Monorail ran right through it – like you could just step onto a train that brought you to Fantasy Land, Tomorrow Land, Whatever Land…Never Never Land…(I can’t remember all those “Lands” or was it “Worlds”?) within a minute or two. “Peter Pan’s Flight” (my bright blue shirt glowed in the dark) and “Pirates of the Caribbean” were my favorites – but the one ride I loved the most was sponsored by the now defunct Eastern Airlines called “The Wings of Man”. I only seem to remember loving it; I don’t remember why. I have this photo of my dad and me in front of Cinderella’s Castle. I remember that trip, and I’m grateful he took me to the “Happiest Place on Earth”. These are the Throwback Thursdays that memories of made of. I never realized, that despite being teased as a fat kid, I wasn’t really that fat – just bigger than the other children, who would ultimately grow up around me, some in grand proportions. I never remembered my father looking so young. I’m a few years older than he was in this picture. That’s a strange concept, especially if you watched a parent grow old and pass away. It makes you value life more than you ever did. Categories: Thursday's 'Getting Through' | Tags: Dads, Disney World | Permalink.